When the original Roland D-50 synthesizer was released back in 1987 it was met with much acclaim. The stunning mix of sampled attack blended with synthesized waveforms made the D-50 one of the defining synths of the late 80's. Now for a whole new generation to enjoy, the Roland D-05 Boutique Linear Synthesizer Module packs in all of the original patches and some new ones to enjoy too. Like the original, the Roland D-05 employs the Linear Arithmetic Synthesis technique that utilises sampled attack sounds and sustainable waveform synthesis. This offered the realism of an expensive sampler and the expression of a synth. 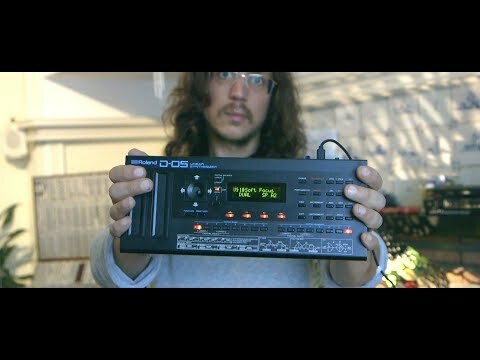 This combination made the original D-50 one of the best selling synths in history and 30 years on, the D-05 can create powerful percussive patches, smooth ambient pads, and staccato sequencer sounds that give you that unique sound you've been looking for. The Roland D-05 packs in a powerful sound engine and all of the original controls including the joystick that allows you to warp sounds in real life. But unlike the original, the D-05 is incredibly portable. Simply connect to a Roland K-25m or other controller keyboard and begin making your new soundscapes. A built in 64-step sequencer and arpeggiator are new additions and are great for performance and sparking new ideas. You also get flexible connectivity with audio and MIDI over USB, space-saving 1/8” analog jacks, and 5-pin MIDI ports. The D-05 can even be an audio interface for your computer, meaning less stuff to carry around, fewer cables, and faster setup. The D-05 can also be powered from USB or by AA batteries so that you can make music anywhere, there's even a built in speaker for true music creation freedom. The Roland D-05 Boutique Linear Synthesizer Module is like taking a complete D-50 and being able to carry it in your backpack. This is a unit that will spark nostalgia for players that used the original and will bring a whole new sound to the synth lovers of today.